Tech Teacher Tidbits: Vegas, Anyone? 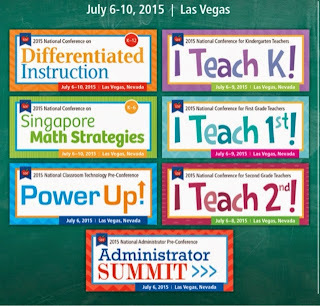 Just thought I'd put it out there that the SDE National Conference in Vegas is happening in July. Click the picture above for a link to the conference. There are conference days for I Teach K, I Teach First, I Teach Second, Differentiated Instruction, and more. There's also A Power Up conference day which focuses on technology; a topic which is near and dear to my heart. And finally...and perhaps best of all...is the Teachers Pay Teachers Conference. I have to admit that it's the TpT conference that I am looking forward to the most! I missed it last year (my daughter got married...yikes!) but I promised myself that I would not miss it this year. So I ask, are any of you wonderful bloggers and/or sellers heading that way? How about any of my New England blog buddies? I'd love to start connecting and planning some fun! Dianne are you going to both conferences? I'm just curious what the total cost is (ballpark figure). I'd love to go but I'm not sure it's in the budget. Unfortunately, I am only going to the TpT conference. I would've LOVED to do all of it but that's just not feasible right now. I hope you can make it!